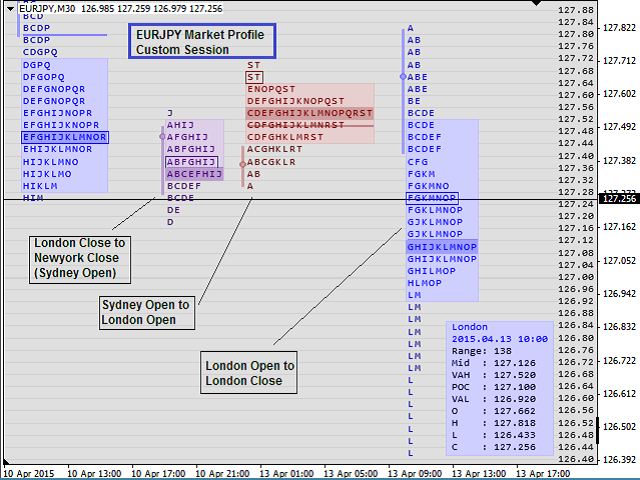 Each group of letters shows the price or price range where trades occured, usually in the 30 minutes chart timeframe. 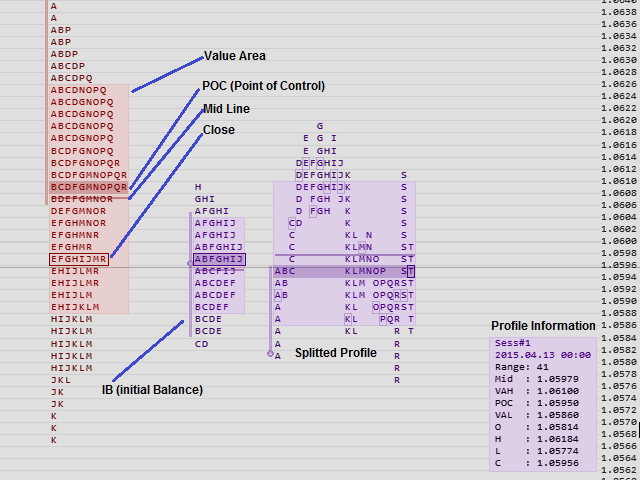 The Point of Control or "POC" shows the price or price range that was the most traded during the profile. Can have up to 4 sessions in each day. 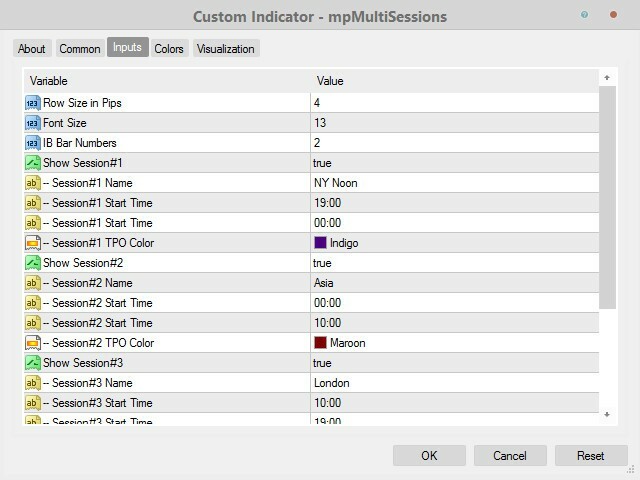 You can choose whether to display 1 , 2 , 3 or 4 sessions by enabling or disabling the session number from indicator parameters. View the market generated data at glance, such as IBR (the Initial Balance Range), VA (Value Area), POC (Point of Controls), Single Print, Half Back (Mid Line). Mark price range levels by clicking additional price scale level created by the indicator. View Splitted Profile (Segmented Profile). Show Tick Volume Profile - Choose whether to show both Tick Volume Numbers and its Histogram, the Tick Volume Numbers only, or hide both. Row Size in Pips - the number of pips for profile price compression. Font Size - font size used to draw TPO. IB Bar Numbers - the number of bars used for initial balance. Show Session#1 - enable/disable session number 1. -- Session#1 Name - the name of session number 1. -- Session#1 Start Time - start time of session number 1. -- Session#1 End Time - end time of session number 1. -- Session#1 TPO Color - TPO color of session number 1. Show Session#2 - enable/disable session number 2. -- Session#2 Name - the name of session number 2. -- Session#2 Start Time - start time of session number 2. -- Session#2 End Time - end time of session number 2. -- Session#2 TPO Color - TPO color of session number 2. Show Session#3 - enable/disable session number 3. -- Session#3 Name - the name of session number 3. -- Session#3 Start Time - start time of session number 3. -- Session#3 End Time - end time of session number 3. -- Session#3 TPO Color - TPO color of session number 3. Show Session#4 - enable/disable session number 4. -- Session#4 Name - the name of session number 4. -- Session#4 Start Time - start time of session number 4. -- Session#4 End Time - end time of session number 4. -- Session#4 TPO Color - TPO color of session number 4. It is nice, but it needs the "merge profiles" function, like in TPO Chart2. You could add the tick volume profile to TPO Chart 2. We should be able to customize more options like the value area size, what If I wanted to use a 25% value area instead of 70%? We should be able to choose the value area to be highlighted based on TPO OR the volume profile. Should be able to show only TPO POC or Volume Profile POC. When those features are added I will give 5 stars. 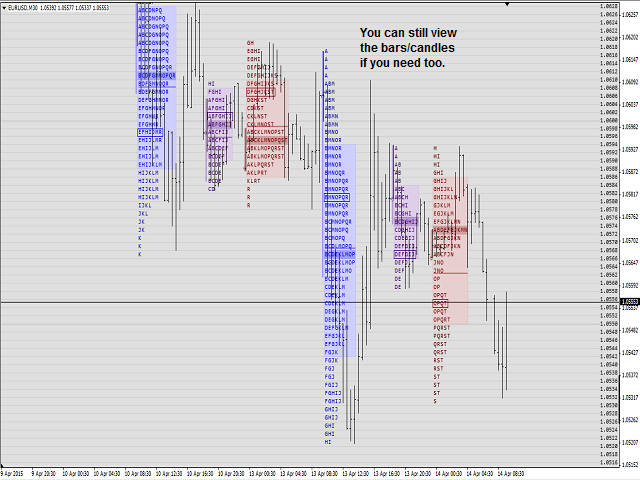 For Market Profile Traders this is probably the best one can ask for. Fantastic tool to visualize Price action. Added volume at price and histogram, volume at price built from M1 (1 Minute timeframe).